This past weekend I decided to make some caramels. Candy making is not my forte but it is something that is really interesting to me. There’s something about the process of making candy that is, to me, unlike anything else that is done in the kitchen. 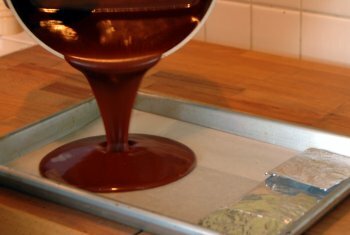 There aren’t any real fancy candy making techniques here other than using a candy thermometer and a (homemade) candy form, but it was fun nonetheless. Getting to transform a few simple ingredients like palm sugar, honey and cream, into something as creamy and buttery as these palm sugar caramels is just a little bit special. Palm sugar is quite an interesting ingredient. It looks a bit like brown sugar but comes in an almost solid block that needs to be broken apart; the variety I used was sold as a large solid disc. I originally tried to chop this into a fine powder with my food processor but it failed badly. Since I was going to boil the whole thing anyways, I just broke it into pieces with my hands and dissolved it in water. I didn’t see much of a problem with this method and everything came out fine in the end. I adapted a recipe that I got while I was in culinary school. To be honest, I wasn’t sure it was going to work. I made these candies only once and that was with supervision. It was a nice surprise to see these come out on my first try. 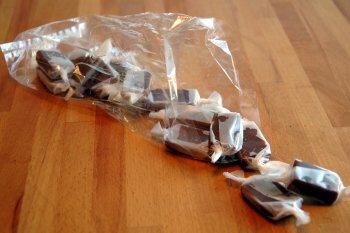 I managed to make enough caramels that I have enough leftover to coat in chocolate (more about that in another post). Boiling sugar is lava-hot. If you don’t want to get burned, don’t touch it while it’s cooking. Use a bigger pot than you think you will need, when you deglaze you will feel better that you did. Did I mention this sugar was going to be boiling? 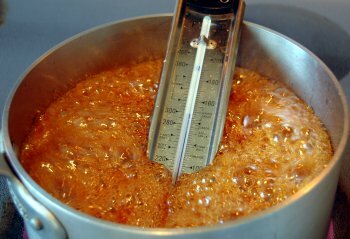 Put palm sugar and honey in a heavy-bottomed pot and cover with water. Cook over high heat until the temperature reaches 160°C. Remove from the heat and deglaze with the cream. Be careful when you do this it will bubble up and do its best volcano impression. Cook mixture over high heat until the temperature reaches 122°C. Remove from heat and pour into prepared form. I used a jelly roll pan with a homemade aluminum foil stopper lined with greased parchment paper. Allow caramels to cool at room temperature. When they are cooled, turn them out of the pan and cut with an oiled knife. The amount of water doesn’t matter since it will all boil off in the end. I just used enough to cover the chunks of palm sugar and went for it. Could you tell me what it means when you say”cover with water” how much water? you said you melted the palm sugar in water? Phylis, eating bacteria is not what harms you, its the waste products of the bacteria. So heating does nothing. I’d say they have a hint of coconut flavor. They also have more of a brown sugar taste, too. 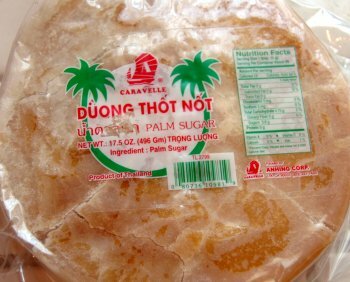 Since palm sugar is usually made from coconut palms and is barely refined, I think that makes sense.